For starters, sorry for the hold–up on the posts. This past week, I’ve been directing Dragon Chess Camp (see teachmechess.com) as a fundraiser for my school. 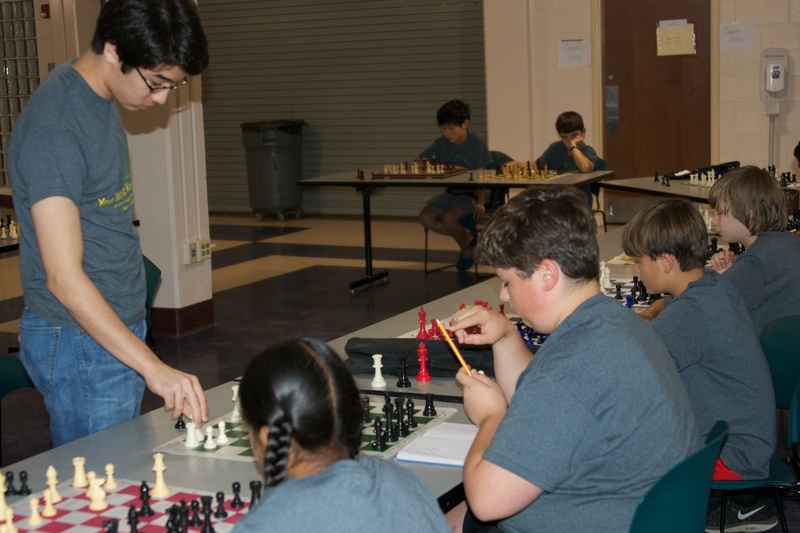 Between my school friends and I, we helped teach 40 campers (double that of last year) how to play better chess. Yesterday, as we were running our end of camp tournament (see results here), a highly rated player from a nearby high school asked me how I prepared a curriculum for my class. I thought that I would share my answers to you all in this post. In my class, I taught five students rated 820–1280, and had to prepare nine and a half hours of curriculum to fill the blocks of the camp. As I developed my lesson plans, I made a couple observations that made it both easier for me to teach, but also made the material more accessible for the students. Stay away from the Grandmaster games. Yes, they are high quality, and yes, the tactics are spectacular, but for a class rated 1000 on average, its asking a lot for them to grasp your points. Mistakes made by Grandmasters are generally really subtle. By using your own games, you don’t need to calculate every move before the lesson because you are already familiar with the position. Also, if you’ve gone over the game with your opponent, you might be able to talk about what your opponent was thinking, and whether it was good or bad. You can’t do that by picking up games on ChessBase. Furthermore, the blunders that you and your opponent make are far more easy to understand. For kids rated about 1000, the biggest problem is generally hanging pieces. Unfortunately, I don’t think you can dedicate a week’s course to not hanging pieces, but you can at least show them how to get in positions where they won’t lose material. For this week, my main theme was optimization, putting pieces on their best possible squares in the opening, so they don’t have to be rerouted later. One issue I’ve noticed with scholastic players is that they love developing their bishops to e2 or d2, even though there is no plan with that piece. Furthermore, they usually box in this bishop with their center pawns and play practically down a bishop with limited space. So in my first lesson, I showed a game where I optimized my pieces, and where my opponent played the aforementioned passive structure. By talking about optimization, I was able to teach the concepts of space, pawn structure, and thematic opening ideas for the rest of week. The key is, have one major theme, and all the sub–themes should connect back to it. More connections will help the kids learn. If you lecture, your students will sleep. Try to let the students collectively talk as much as you are. This is hard to do, but if you can make the kids feel like they are beating the 1800+ rated player and not you, it will be a lot more exciting for them. This past week I assigned some pawn endings and interesting studies to get the kids thinking as a warm–up. Even if the homework is really hard. Having a crazy tactic to start the day might impress upon the kids. The critical point is to talk about the ideas behind the right move and show the students why it works and other variations don’t. Get the kids to play practice games against each other, in tournament–like conditions. This will not only help you gauge the talent of your players, but also give you an opportunity to work one–on–one during game analysis. While it is critical to show them the best moves throughout the game, it is even better if you can connect the moves back to your lesson. With those five tips you can be well on your way towards teaching a group lesson!